Mike Barish is serving as a Volunteer Probationary Firefighter or ‘Proby,’ which is the lowest rank in a fire department rank structure. The primary responsibility of the ‘Proby’ is to train to be a firefighter, while being mentored and instructed by senior firefighters and officers. 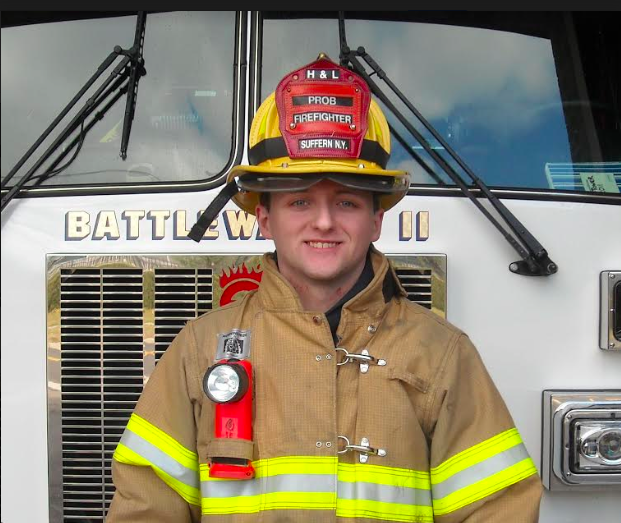 Our Unsung Hero this week is Mike Barish, who is serving as a Volunteer Probationary Firefighter or ‘Proby,’ which is the lowest rank in a fire department rank structure. The primary responsibility of the ‘Proby’ is to train to be a firefighter while being mentored and instructed by senior firefighters and officers. 1 Arrive early. Arrive at least 30 minutes before the shift begins. This will provide the opportunity to become familiar with the apparatus assigned. 2 Be social. Introduce yourself to everyone you meet. These are the men and women you’ll be putting your life on the line with. It’s also important to understand the ranking system. 3 Find a senior firefighter. A good senior firefighter on your shift will be a great asset. 4 Be proactive around the firehouse. As a Proby, you basically do everything including answering the phone and doing the dishes. 5 Know the riding positions and responsibilities. Everyone on the apparatus has specific duties and tasks that they’re expected to know and accomplish in order to ensure success at an incident. 6 Stay physically fit. Firefighting is a physically demanding job, so eat healthy and work out. 7 Be a team player. Crew continuity is built in the fire station, but teamwork is fine-tuned on the training ground and at the fire scene. 8 Be accountable. If your officer asks you to do something on the fireground, do it, then immediately report back to him. 9 Make safety your priority. On the fireground, it ‘s easy to get caught up in the moment. Take the time to think about what you’re doing before you do it. 10 Check your equipment. Check your Personal Protective Equipment (PPE), your Self-Contained Breathing Apparatus (SCBA) and tools, such as nozzles and saws. 11 Ask questions. You’ll be working with knowledgeable firefighters, but to benefit from their experiences, you must be willing to make the first move. False Alarms are a problem because they take firefighters away from real emergencies. Common causes of fire alarms include cooking, a faulty alarm panel or detector, a smoke detector activated by dust, a technician working on the system, steam, a homeowner testing the alarm, construction processes or a sprinkler malfunction causing an alarm to be activated. Therefore, firefighters are rushing unnecessarily from their stations using personnel, equipment and the fuel needed to roll engines to thousands of calls. They disrupt traffic as fire trucks with lights and sirens enter busy streets. A tiller truck, also known as a tractor-drawn aerial tiller ladder or hook and ladder truck, is a specialized turntable ladder mounted on a semi-trailer truck. One of the main features of the tiller truck is the enhanced maneuverability. The Tillerman maintains a rear-steering position in an elevated cabin because the back end is a trailer that steers independently of the front end of the truck. The tools and ladders carried on the aerial ladder truck are most often used at fires to perform a task known as ventilation. This action involves the Tillerman climbing to the roof of the building to cut holes that allow much of the heat and smoke inside the burning building to escape. Doing this improves conditions for firefighters inside who’re trying to extinguish the fire and locate any victims. For information about volunteering for the Suffern Hook & Ladder Company No. 1, call 845-357-6066 or visit www.suffernfire.org.